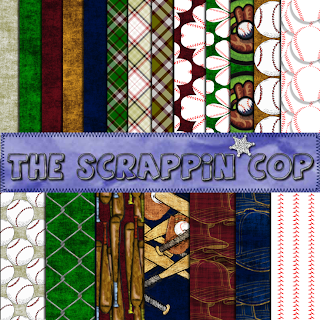 The Scrappin Cop: The Baseball .PAT and Image Pack is here! The Baseball .PAT and Image Pack is here! Good evening all! This set took me awhile because as you know I can't draw and although there are about sixty thousand baseball images on ClipArt, I struggled to find some that I really liked and wanted to make into patterns. I picked a few and modified them a little, recolored them, ran them through filters, etc. I'm not totally thrilled with them but I think when I am off tomorrow I will search more and try to make some elements to use with these patterns. Anyway, I did receive a couple of comments requesting the .PNG tiles so I made an image pack of the tiles if you can use them. I made them a separate link so you can just choose which one you want to download. There are 5 solids and a few plaids and also a bunch of baseballs, bats, and a fence on transparent backgrounds so you can layer them over the solid colors in the pattern set or your own papers. There are also a couple of solid white w/red seam tiles which are kinda cool. I've been hunting for some baseball paper. Thanks for ending my search and for sharing your talents! These are beautiful, seeing as my eldest is back to baseball again I am sure I can put them to use..
Love the depth that are in these.. I think both paper sets are wonderful. Thanks! Thank you so much for the awesome baseball designs! And thank you for the .pngs, as well! I have 4 nephews, the lights of my life, who are baseball players and fanatics! :) Can't wait to use these!